After their initial growth, the small nodules or cords typically keep their size for about 5 - 6 years. Then the contraction process starts to bend the fingers. It is usually only at this late stage that patients start to seriously consider an efficient therapy, e.g. surgery. It is less well known that radiotherapy is highly efficient in the early stage of this disease. Below is an example of Dupuytren's contracture (Dupuytren's disease, morbus Dupuytren) in an early developmental stage (upper nodule, dotted line) and an initial stage (lower nodule), without contraction of fingers (= stage N). The solid line indicates the area to be exposed in radiation therapy. It is worth noting that not every patient with Dupuytren's disease will develop bent fingers. Specifically when the disease starts beyond the age of 60 many patients never get beyond nodules and possibly cords, and don't experience a severe extension deficit of their fingers. This overview does not cover every aspect of Dupuytren's contracture. For more details we refer e.g. to the Dupuytren's FAQ page of the Dupuytren Foundation Dupuytren's_FAQ. Not every nodule in or on a hand and not every bent finger is necessarily caused by Dupuytren's disease. Before proceeding with a specific Dupuytren therapy it is important to exclude other diseases. An article in emedicine (dupuytren_contracture) is listing other problems that can cause nodules or thickening in the hand but are not related to Dupuytren's disease. Bent fingers can have a variety of root causes, e.g. camptodactyly or trigger finger, but also many others with Dupuytren's disease being only one of them. Each cause would mandate a different therapy thus requiring careful diagnosis by an experienced physician before starting any treatment! How are stages of Dupuytren's contracture defined? Following Tubiana the degree by which the finger is bent is used to grade contracture into several stages. If more than one joint of a finger is bent, the angles of contracture are simply added together. Based on this total angle of contracture stages in the development of Morbus Dupuytren are usually classified as below. The initial stages N and N/I show no, or very little contraction. Stages are defined according to an extended Tubiana scale. Measuring the angle (extension deficit) of Dupuytren's contracture. In this diagram stages N and N/1 are omitted and Stage 1 covers 0 - 45 deg. First of all it is important to understand that not every patient with Dupuytren's nodules will experience contracture. Seegenschmiedt et al. abstract compared patients treated with radiotherapy and an untreated control group with an average follow-up of 8 years. In that period 2/3 of the untreated patients experienced no increase of the extension deficit. The aggressiveness of Dupuytren's disease may depend on several factors, one of them being age. People who develop initial signs of Dupuytren's at the age of 70 or later will often not need treatment at all. Some of the currently available therapies are not equally efficient in all stages of Dupuytren's disease, as shown in below overview. The optimal therapy does not depend on stage alone. For example, while in stage III surgery is usually the standard therapy, NA might still be a good choice if the patient is too old to undergo surgery or is taking medication that makes surgery more risky. Recently successful treatment of stage 4 with NA has been reported Dupuytren's stage4 NA. Note that there are several different hand surgery techniques for Dupuytren's contracture, some techniques are less invasive but might have a higher recurrence rate. For an overview see hand surgery_technique. Some people, especially when in their middle years and their joints are packing up, take glucosamine and chondroitin to build up new collagen in their joints and reduce inflammation. We cannot judge the effectiveness of these supplements for improving joints or for relieving osteoporosis (you might e. g. read quackwatch for more information or have a look at D.O. Clegg at al. "Glucosamine, chondroitin sulfate, and the two in combination for painful knee osteoarthritis" New Engl J Med. 354 (2006) p 795–808. PMID 16495392 and the 2-year results of the GAIT study). But occasionally Dupuytren's patients report that taking glucosamine / chondroitin triggered quick growth of their Dupuytren's nodules and stopping it reduced those nodules (e.g. forum_glucosamine). So, if you suffer from Dupuytren's or Ledderhose, it might make sense to watch out for accelerated growth of the nodules if you are taking glucosamine. Please note that this link is not firmly established. A recent survey of more than 2,000 patients by the Dupuytren Foundation did not exhibit any significant connection between the severity of Dupuytren disease and taking glucosamine or chondroitin. Specific antiepileptica, i.e. anticonvulsant medication like phenobarbital (brand name e.g. Luminal), can possibly trigger Dupuytren's and Ledderhose disease (and other diseases like Sudeck's syndrome and polyfibromatosis). See: J. Rothmeier and W. Froscher "Connective tissue changes during longterm anticonvulsive therapy" Fortschritte der Medizin 107(1989) p743-747 und P. Coral et al. "Dupuytren's and Ledderhose's diseases associated with chronic use of anticonvulsants" Arquivos de Neuro-Psiquiatria. 57(1999): 860-862. Adam Strzelczyk, Heinrich Vogt, Hajo M. Hamer, and Günter Krämer "Continuous phenobarbital treatment leads to recurrent plantar fibromatosis" Epilepsia May 2008 abstract conclude "that patient groups ... develop Ledderhose syndrome or other associated syndromes such as Dupuytren's contractures, frozen shoulder, Peyronie's disease or complex regional pain syndrome in the course of phenobarbital treatment." While the link with with phenobarbital seems to be established, there is much less evidence that phenytoin (brand name e.g. 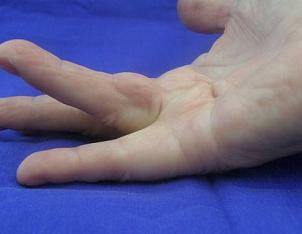 Dilatin) can trigger Dupuytren's contracture or Ledderhose disease. We also want to mention the study by J.M. Geoghegan et al. "Dupuytren's disease risk factors" J. Hand Surg. [Br] 29 (2004) p 423-6, which does not find any relation to anti-epileptic medications but a strong relation to diabetes and specifically to insulin controlled diabetes (not as strong if diet controlled) Duypuytrens_risk_factors. Dupuytren's contracture and plantar fascial fibromatosis have been reported with the use of venurafenib (brand name: zelboraf). Venurafenib is a selective inhibitor used in cancer treatment. A warning has been issued by Health Canada (August 2017).